The absolute advantage of the apartments is the space and access to natural sunlight. Since the original sizes of window openings will be preserved, a lot of daylight will penetrate into the rooms, which will make the space look optically bigger and nicer. 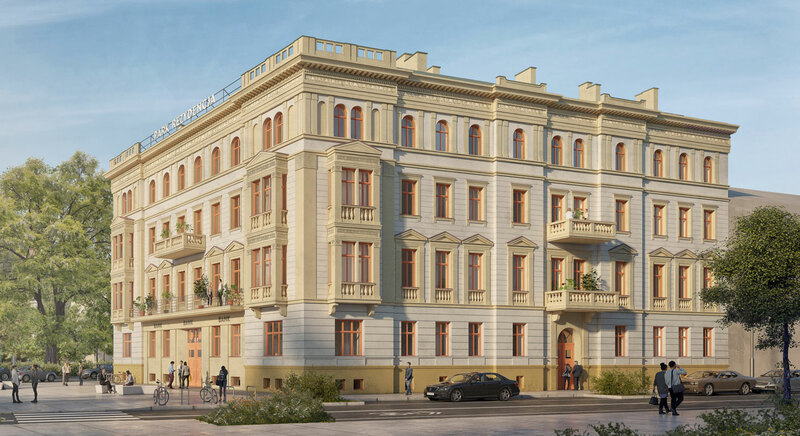 However, space is not only light, it is also air; there is more of it in rooms that are 320-340 cm high; therefore, apartments and premises intended for commercial activities in the tenement house will be of such height. All rooms will be equipped with gravitational ventilation. Higher ceilings provide also more possibilities for interior designers. Depending on the final apartment style destination or commercial premises, there can be used various details, such as stucco decorations in case of the classic style, lighting on long cables used in the loft style, crystal chandeliers reflecting the glamour style, as well as gradation of the ceiling and stretch ceilings in a modern style. The ceilings on each floor will be secured with REI 30 fire resistance lining. The access to the whole building for the disabled persons will be provided by the installation of stairs platforms and internal elevators adapted for the disabled persons. Our mission is to combine history with modernity; that’s why eclecticism is not alien to us and every interior will harmonize with the whole house. You can convince yourself of it by looking at the exemplary interior arrangements and visualizations.